Welcome to the discussion thread for the 2012-2013 season of the Hornby eagles. This will be the first full season with HEGPS' Nest & Territory webcam, which gives us a broad view of Mom and Dad's perch trees as well as the nest tree. This cam originally came on line in April 2012. In September, Dan and Dale of Whiskey Jack Tree Services raised the cam another 25 feet to a higher position on Gregg's Tree. This video shows part of the cam raising and some of the spectacular views that we now have. The eagles built their first nest in this tree in late 1989, and as far as we know, the same pair continues to nest here. The first nesting season was in 1990 and 2013 will be nesting season #24. Answers to many basic questions about the nest and about Mom and Dad and their offspring can be found in the Reference Center of this forum: http://www.ournaturezone.com/index.php?board=26.0. The Ground Observations topics for the last few years also have a rich visual history thanks to boonibarb, a resident of Hornby Island. Each year in late August, the eagles leave the Island and go in search of the salmon runs, where they feast on the spawned-out salmon. Each year, they arrive back on Hornby in early October, having been away for roughly 6 weeks. We expect Mom and Dad Hornby to arrive back any day now and are having a contest to see who comes closest to the actual date of their return, as seen on the webcam, and their first visit to the nest. Contest link: http://www.ournaturezone.com/index.php?topic=1229.0. October 2 is the day they are usually spotted in their territory, and they usually visit the nest within a couple of weeks after that (see Doug's Timetable: http://www.ournaturezone.com/index.php?topic=38.0). In 2011, their return was a bit later (Oct 10 for the first sighting of Dad in his territory). Please feel free to discuss the eagles and what you see on the nest in this thread - plain screenshots or links to videos from the broadcasts are welcome here also. Eagles visiting in Mom and Dad's territory. One (at least) is spotted on the BabySitting Tree and the Peter's Tree, both are heard calling and trilling. At first, we thought these eagles were Mom and Dad, but close scrutiny of booni's photographs proved otherwise. The large eagle that we first took as Mom (but isn't) has a unique voice - sort of a "chuff, chuff". This video clip from Oct 5 and Oct 6 is a sample of her voice. Eagle on BST flies to nest at 6:58 PM - Mom Hornby is clearly home. First delivery of nest materials. Mom and Dad both bring clumps of grass and a fir branch. A large (female?) eagle was chased by Mom and Dad. I *think* what happened was that an eagle - not one of the Hornbys - landed on the BST and was immediately chased off by Mom, who flew in from the left. Dad landed on the CU box but then joined the chase. First "bonding" (mating) was observed on camera on Dec 2. Another such mating was seen on December 8. A juvenile was observed sitting in Foster's Fir on Dec 18. Jan 14, one of the eagles flies into the nest. The cam gives us a wide view of the area - this view includes the nest tree and the babysitting tree (BST) to the right. February has been a challenging month for the Hornbys. There have been young visitors to the area, spotted by boonibarb during ground observations. More alarmingly, there were a series of confrontations with adults (or subadults), both in the air and on perch trees. One adult intruder landed on the nest tree and in the nest itself with Dad (Feb 8-11). Dad was not pleased and reacted by beaking or wing-slapping this eagle, who seemed to be begging for food gifts from him. At one point, though, she appeared to push him from the nest (Feb 10). Mom Hornby was not seen for four days (Feb 8-11) - the same days that this apparently female intruder was in the nest with Dad. Feb 11 was a day of eagles displacing each other from the perch trees, and on Feb 12 we saw Mom and Dad mating on the Babysitting Tree. Since then, Mom and Dad have been together and the "chuffing" intruder eagle has not been heard, although an adult did buzz the nest on Feb 21. • Feb 1 – an eagle flew at another eagle in the BST, crashed through branches. No injured bird was found by boonibarb, the ground observer. • Feb 3 – Visitor? knocked off BST, Mom and Dad mated on Constables, both visited the nest. • Feb 4 - At least one visitor in the area. Two confrontations on the nest, one in air. • Feb 5 – At least 5 confrontations, including an intruder landing in the nest and getting trounced by one of the nest owners. • Feb 6 – More youngsters spotted by ground observers; one perched on Mishi’s Tree when two eagles were in the nest. 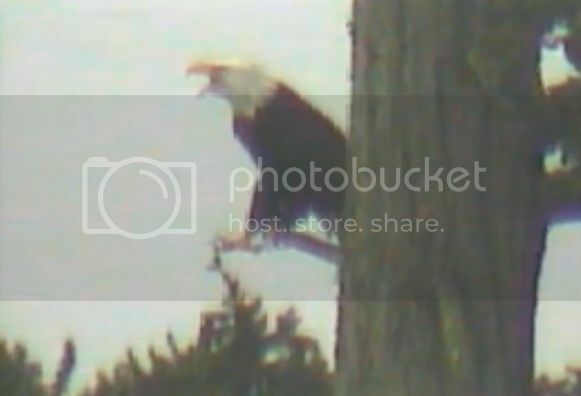 The “chuff chuff” eagle was heard (was this the same "chuffer" that was seen and heard in early October?). • Feb 7 - Mom was heard calling, young eagles escorted out of area. Chuffs were repeatedly heard. • Feb 8 – Intruding female landed in BST, squealed as Dad was coming in. He landed in the nest, she flew from BST to nest. Mom was not seen. • Feb 9 – Intruding female was in the nest, in a submissive position making pleading or feeding calls, with her hackles up. 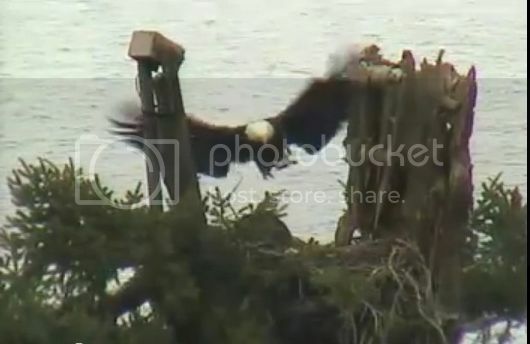 The other eagle (Dad) moved a stick and then beaked the pleading female, also slapped her with his wing. Mom not seen. • Feb 10 - Intruding female was on the nest, and at one point appeared to tussle with Dad and push him out. 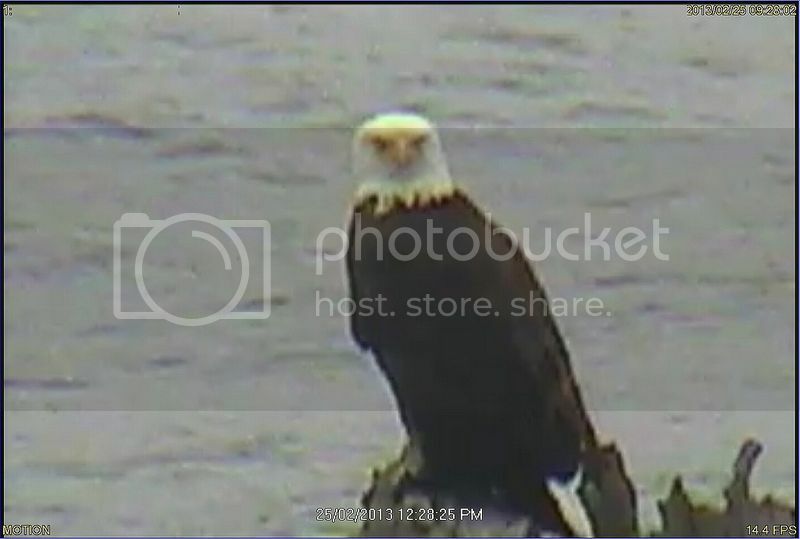 Eagles spent the day displacing each other from WA cam, nest, BST. Mom was not seen. • Feb 11 - Intruding female was seen on the nest tree stump and WA cam and probably on other perches; “chuff chuffs” were heard from the area of Gregg’s Tree. 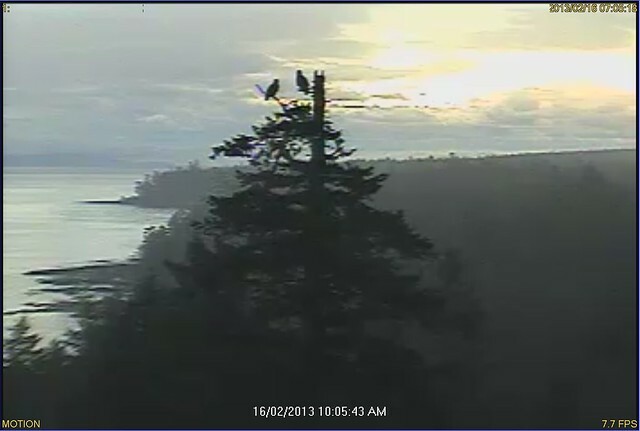 Eagles were displacing each other from BST, WA cam all day. A subadult was spotted by booni, on the BST at 10 AM, chased off by Dad(?) At different points, four and then five eagles were noted in soaring chases. However, “cachunkas” were heard, so we knew that Mom was around although she was not seen on the cam. • Feb 12 - Mom was clearly around, but a third eagle was still in the area. Mom and Dad mated in the Babysitting Tree. • Feb 13 - Mom was heard cachunking through out the day. Mom and Dad visited the nest and mated on Peter’s Tree. • Feb 14 - Mom and Dad were in the His & Hers tree this morning, when a third eagle landed. They protested mildly, but allowed the other eagle to stay. Weather was poor. • Feb 15 - Alert calls in the morning Youngster again on H&H. Mating on Peters’ Tree. Mom and Dad alerting around 7:53 am- Dad is on a left branch down lower on the BST. • Feb 16 - Dad brings a food gift to Mom – looks like small fish in his left foot. Mating in Peter’s Tree about 20 minutes later. Both spend time in the nest before dark. Daybreak on Feb 16, 2013. Mom and Dad on Constable's Tree, at sunrise. Screencap by Sparkie. 16:24:10 - Dad brings a food gift to Mom. Archive video by boonibarb. • Feb 17 - Dad was working on the nest, moving sticks and scootching. Mom ate on the nest for a good half hour. Sunrise on Feb 17. Screencap by Passerine. • Feb18 -Youngster visits the Glass House tree (near Grassy Point). Dad delivered a gift to Mom, possibly a bird with dark feathers. Several visits to the nest. A chase perhaps late morning and later in the afternoon when birds flew past the nest. • Feb 19 - Nest visits, calls and alerts, mating on the Peters Tree late afternoon. • Feb 20 – Two eagles soar nearby while Mom and Dad are on the nest and WA cam. Food was in the nest, which first Mom ate and then Dad. Just before noon Dad delivered two clumps of grass to the nest. Dad was on the BST and snagged a branch as he flew off – was he trying to snap it off? • Feb 21 - There was food on the nest and an adult was seen buzzing the nest a couple of times in the morning. Both Mom and Dad ate well, but the dark-colored food was not identified. Thank you so much Nancy I'm very happy to see this discussion thread here! great, Foldi! we hope you and others will add screencaps and comments. I am just trying to play catch up for February. • Feb 22 - Mom and Dad mated on the Peters’ tree in the morning and again in the evening. Both visited the nest a few times during the day. • Feb 23 - Lots of calling and trilling. Mom and Dad mated on a tree far from the ones we usually see them on – perhaps at the border of their territory. Crows were active and flying around. A large bird flew past the BST a few times, eliciting calls and trills from the eagles. A woodpecker landed on Gregg’s Tree and could be heard tap-tap-tapping. • Feb 24 – Weather was really poor – low visibility and very windy. 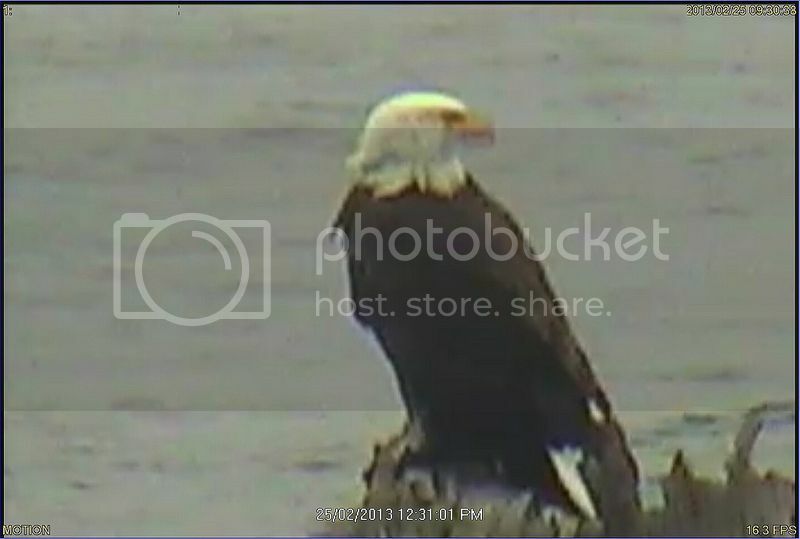 Eagles visited the nest a couple of times, plus Peters Tree, the BST, and Hidden Beach. Dad brought a stick to the nest. Another eagle was seen soaring in the area and might have been chased off. • Feb 25 - An adult eagle was in the area, was chased by Mom and Dad around 9 AM, and then flew past the BST several times. Dad found food in the nest, Mom came to eat it. Dad brought a stick to the nest. An eagle was in the His and Hers tree, and was driven away (at first we thought Mom wsa in the HH tree and was driven out, but now I think it was an intruder in the tree and was attacked by either Mom or Dad). I like this discussion thread too and hope it gets used by everyone. On February 25th Dad was seen on the stump of the nest tree. Relaxing? Guarding his territory? What a wonder it is to see the things that we once only heard, or wondered about! February 25th; Dad watches us watching him! True Mishi, we'd hear something on the stump, or see some tail feathers and wonder who was doing what. Now we can see. I was so lucky this morning to have some time to sit and watch the cam. I managed some screen caps of the sunrise and even saw Mom and Dad mating in Constables! What a glorious way to spend my morning!! They mated soon after this scap...I was so awed my clicking finger froze!! But I did get a couple of scaps after! Here they seem to be re-grouping as the sun rises in the sky.